So, do you know what health is? If your answer is "no" don't feel bad. Most don't. In fact, not many people can give a very good answer to this question at all and that includes people we recognize as health professionals! If your answer is "yes" that's great. You may be one of the very small number of people who can give a really quite satisfactory answer. Or maybe not. Are you sure you know what health is? You see I have personally verified through countless interactions with many people over many years that few people really understand what health is. I also conducted some research to find out exactly what health professionals (doctors and nurses) think health actually means. I was quite disappointed by the professionals' responses. I regularly encounter statements about health from "health authorities" like government health departments. Sometimes I wonder if they actually have any ideas at all about health. All they focus on and talk about is disease! So let's see what health is NOT. Health is not just the absence of disease. Health is not just an unachievable ideal. Health is not something you can afford to ignore. Health is not provided by doctors. So if health is not any of those things listed above, where can you find out just what health is? From my tutorial of course! And the list could go on. Yes, those should be valuable sources of answers to the question but sadly, most aren't. Let me answer it like this. I assume you do have some idea of what health is - enough to know it is highly desirable to be healthy. So health we could say, is your goal. Can you imagine what a game of football would be like if what constitutes a goal was unclear? Imagine all those players running about the field with all the skills and tactics but no clear understanding of what the goals were. Imagine what it would be like if the fans didn't really understand either. Chaos, confusion or simple lost interest would take over. Any goals scored would be more by accident than intention. That's no way to play football. So if health is one of your goals -- and I hope it's a very important one -- how much easier would it be to achieve if you had a really good understanding of what it is? That would help a lot I'm sure. Well, I spent many years both as a primary health care practitioner and as a university lecturer in primary health care. I critically evaluated the notion of 'health' and studied how people use - and misuse - the concept. Then I set about clarifying an understanding of health that is positive and constructive so that people can set meaningful and real health goals. So discovering just what health is enables a clear understanding of your goal, with no confusion or errors to distract you. That makes health much easier to achieve. 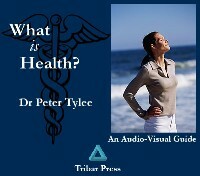 This audio-visual guide is a 66 minute tutorial that explains just what health is. I don't explain how to achieve it (that's in my other publications in detail) just what it is. Whether you are a health professional who would like to think through your understanding and develop a positive concept of health or simply someone who appreciates that clearly defining a goal makes it much easier to achieve, this guide will help. This tutorial is a downloadable publication that you could be discovering new things from in a matter of minutes from now. It was developed in presentation software and then converted into a Flash video format that will play in your web browser right on your computer. Being flash, you can run it whether you use Windows or a Mac or even Linux. This tutorial is very affordable. It's less than 20 dollars. You can own this tutorial right now. In a little over an hour you could be inspired with a new-found clarity about just what health is. You can purchase using a credit card or your balance using PayPal. The transaction is completely secure and I never receive your credit card or account details. You can't go wrong by investing in this education. I guarantee to refund your purchase price any time within 8 weeks if you are not satisfied. You may go wrong however if you don't learn what health is or if you learn from a poorly informed source. Don't make those mistakes -- download this guide now. payments from Bank Accounts, Debit Cards, Credit Cards, eChecks for US customers and PayPal accounts. We provide an 8 week 100% money back satisfaction guarantee. Discover just what health is. Then plan to enjoy it. To reward and congratulate customers for taking positive action to improve their own health we have a special offer. Just follow the link below.